An element of the exhibition depicting ceremony and dance, in the Janet Holmes à Court Gallery, Lawrence Wilson Art Gallery. Photographer: John Stanton, 12th February 2019. The 8th of February saw the formal opening of the Berndt Museum’s new exhibition, Carrolup Revisited, at the Lawrence Wilson Art Gallery, The University of Western Australia, which will last until the 29th of June. It was an emotional occasion for families of the child artists present, and others who have been closely associated with telling this story over the past decades. 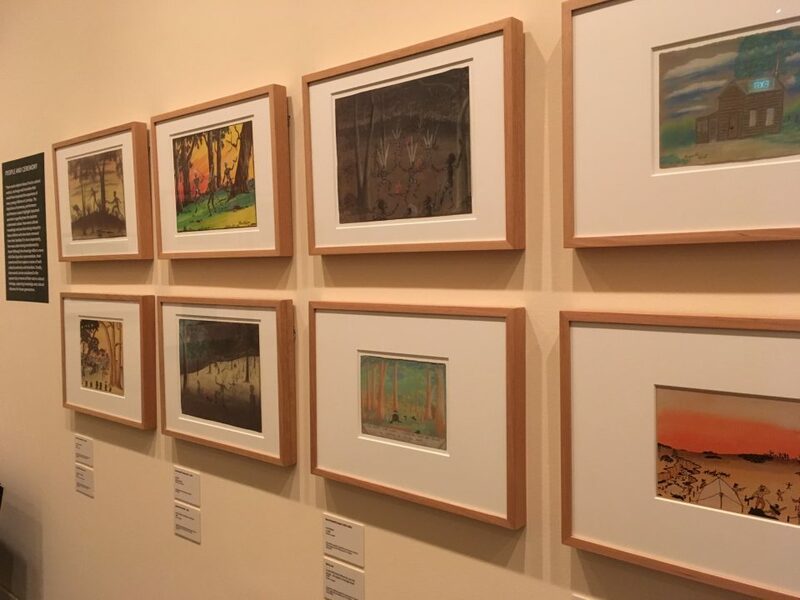 Personally, I was deeply moved to see the works I know so intimately back up on the gallery walls, highlighting particular themes taken by the child artists in their initial pastel, ink and watercolour drawings. Museum banner advertising the exhibition. Photographer: John Stanton, 12th February 2019. The schoolteacher Noel White, and his wife Lily, made an enduring impact on the child artists, boys and girls alike. Their enthusiasm, passion and encouragement contributed to an early and rapid achievement of artistic success and credibility among national and international audiences, as recorded in the photographic and clippings scrapbooks held by the family. The Whites’ daughter Noelene, and her late brother Ross, have been constant supporters and benefactors to the Berndt Museum since I commenced the Carrolup Project in 1985. The core of the Museum’s holdings of Carrolup art is a collection of some 150 pieces donated by Stan, Melvie and Gael Phillips in the early 1990s. ES (Stan) Phillips was an Art Teacher (and an artist), based at Bunbury High School from the beginning of 1951 until the end of 1963, who travelled around the South West for some of his time supporting Art Teachers and giving demonstration lessons for the Education Department. In 1964, he took up an appointment as an Advisory Art Teacher in Western Australia, and became the Senior Advisory Art Teacher, based in Perth, but travelling around the State on a regular basis supporting Art Teachers all over the State. Stan’s fascination with the imaginative creativity of the child artists led him to assemble this collection from a diversity of sources, including original purchasers of these drawings, second hand shops, and the like. With the eye of a connoisseur, Stan assembled an enduring resource for Noongar people; indeed, for all Australians. The staff at the Berndt Museum and, in particular my successor as Director, Dr Vanessa Russ, are to be congratulated for curating and mounting such a moving and inspiring exhibition.